A classic colorway is renewed as the Christmas Grinch colorway returns on the Flyknit adorned Nike Kobe X Elite Low model. Also dubbed as the ‘Coal Hearted’ colorway, the Nike Kobe X ‘Grinch’ features the same volt upper, translucent volt bottom and red laces as the original Kobe 6 ‘Grinch’. This version mixes it up with a premium looking Flyknit upper, with a lighter green used on the toe for contrast. This upper is the basis for the Grinch colorway and is available in limited supply, much like previous ‘Multicolor‘ and ‘Mambacolor‘ options. Of course, you can change most of these features as the shoe is on Nike iD where you can mix up the laces, midsole or swoosh colors with no additional charge. 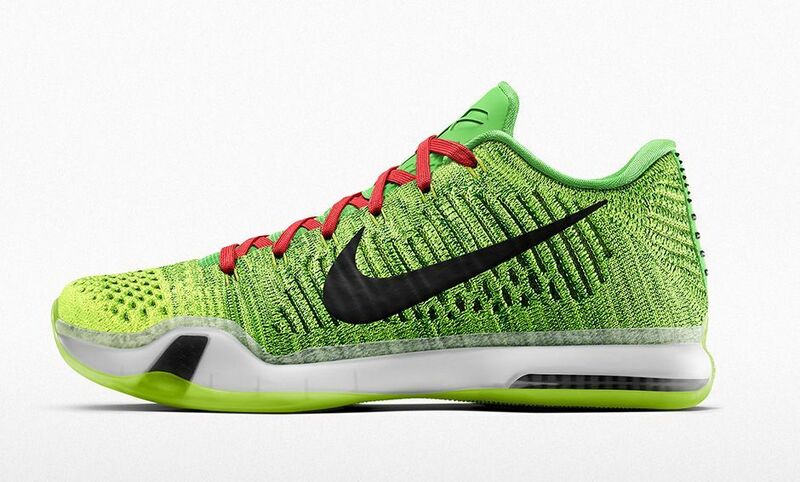 Click HERE to customize your own pair of the Nike Kobe X ‘Grinch’ for $245.